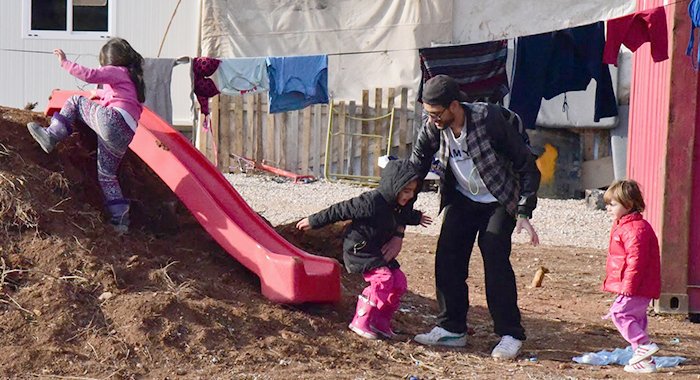 Refugee children play in a makeshift playground. Gap Experience students can look to Diana Delbecchi, assistant director of the program, as an example. Delbecchi continues to support Syrian refugees as they seek asylum in European countries. In May, she traveled to the Netherlands and Sweden to visit refugees she befriended while serving at a camp in Ritsona, Greece. “In the Netherlands I saw one of the young boys who was unaccompanied,” she explains. “He was only recently resettled in August. He was reunited with his mom, dad and younger sister, who is 16. They had been living in Damascus and had sent him (out of the country). They feared for his life.” Many Syrian parents sent their sons to refugee camps in Greece and Italy to flee the conflict in their homeland. Young men in Syria may be conscripted into the army to fight for the Assad regime or for rebel groups, says Delbecchi. If they stay, they may die in conflict. During her recent travels, Delbecchi also met with a young Syrian man in Stockholm, Sweden. He too was resettled form the refugee camp in Greece. Unlike the young man in the Netherlands, his family will not be reunited. Delbecchi never envisioned that she would be working on the ground at a refugee camp. Following graduation from the University of Wisconsin-Green Bay, she worked in higher education for five years before earning a master’s degree in gender, globalization and human rights from the National University of Ireland. In the fall of 2016, Delbecchi committed for a month to research educational opportunities for refugees, ages 15 to 25, at the camp in Ritsona. She interviewed a large number of refugees and presented her findings. Delbecchi was then asked to implement programs based on her research. In Greece, people 15 or older are not required to go to school. Delbecchi ended up staying in Greece for four months. Before she left, I Am You partnered with Lighthouse Relief, an organization with more funding, to continue the programs. “These young men are the most vulnerable, in my opinion, of being radicalized,” says Delbecchi. “We did see ISIS militants in Greece trying to recruit. Our big effort was to try to keep them occupied and engaged, so they didn’t feel so detached and angry about the waiting period” (an average of 18 months for asylum). Delbecchi’s support of Syrian refugees in Greece has extended to include collaboration with the college. She was approached by Bob Pyne (Community Engagement), and Marc Schaffer, assistant professor of economics and director of the St. Norbert College Center for Business & Economic Analysis (CBEA), about an education project to provide food to the camp. Four St. Norbert students are working on the project, which involves the Farmory, a nonprofit that produces sustainable, indoor agriculture. When Diana Delbecchi (Gap Experience) returned to Green Bay following her first experience in Greece, she felt lost after serving on the ground in a refugee camp. She needed to do something to “give myself faith in humanity again.” Delbecchi began working with Somali refugees, particularly in Brown County. That work has led to a book project. Delbecchi says that a lot of people have valid questions for the Somali women, but are afraid to ask.